The tempering furnace is ranked among the industrial furnaces, is a system commonly used for metal treatments. It is used in metalmechanic and metallurgic industries, and for the annealing of noble materials, or in every industry in which is necessary a hardeding of a metal. The tempering, also called cementation, is a procedure that aims to give particular hardness to the material. The treatment is composed by several phases, that take advantage of the chemical composition of the material itself in order to reach the purpose. First step takes place right in the tempering furnace: here, the material is brought to a temperature that allows the transformation of a solid solution called austenite in martensite, essential in order to confer hardness to the material. A tempering furnace reaches temperatures that go between 30° and 70° C greater than Ac3. The variation depends on the following cooling mean chosen, that can be oil, air, water or salt baths. The water technique is anyway rarely used, as the vapors cause a slower cooling compared to the other ones. 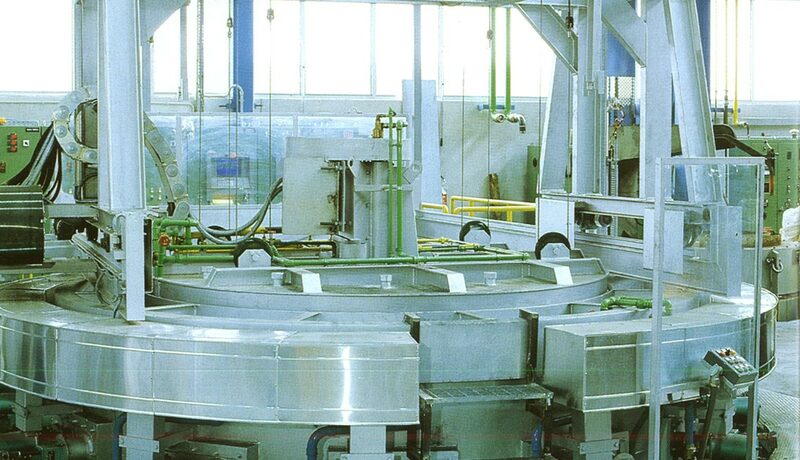 A tempering furnace made by Campana Forni allow to reach these temperatures gradually. In this way, cracking phenomenon can be avoided. The time spent in the tempering furnace can vary too, depending on the material that undergoes through the treatment. So, we can go from the few minutes of steel to up to an hour for high alloy chrome steels. It is also important to protect the material using particular balsamic oils, in order to avoid oxidation and decarburization. Following the phase inside the tempering furnace, the material goes through the cooling step. It is only in this way that it acquires the mechanical hardness feature that are the purpose of the entire process. Thanks to the professionalism and experience earned through the years, Campana Forni is able to build for you a customized system, designing and realizing it according to your needs. We will also stand by you after the deliver with our assistance service.